Beautiful set of two lunch skins: a sandwich bag and a snack bag with different motifs: citrus fruits and cherries; a nice combination in green. Lunch skins are reusable bags for food as well as other things like crayons, dog tags, makeup and more. The bags are handy for lunch or snacks to school, work or on and on. Once at home they go under the tap or dishwasher and they are ready for endless use a few hours later - dry and clean. 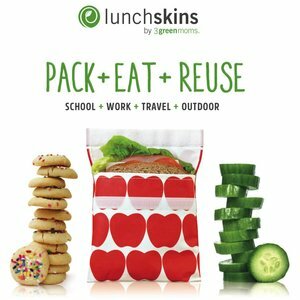 The brand Lunchskins is a part of 3greenmoms.com's business. Their mission? Replace plastic with smart, durable solutions that are easy to use for everyone. For example, the use of 1 lunch skins is equal to 500 disposable plastic (sandwich) bags. Therefore, we can say peacefully that lunch skins are more durable than disposable bags. LunchSkins are dishwasher safe. Turn them inside out for washing, and let them dry well before filling them with food. Wash for first use. They will soften and fade with the use and multiple washings, just like some of your favorite old jeans. To keep them new, wash hand and dry in the air. We wrote a blog about Lunchskins earlier: The most asked questions are found here .